Around 100 million years ago beneath what is now Joshua Tree National Park, an upwelling of molten rock oozed toward the Earth’s surface. As the rock cooled, it formed a vast block of intrusive (beneath the surface) igneous (from the Latin ignis, meaning “fire”) rock. 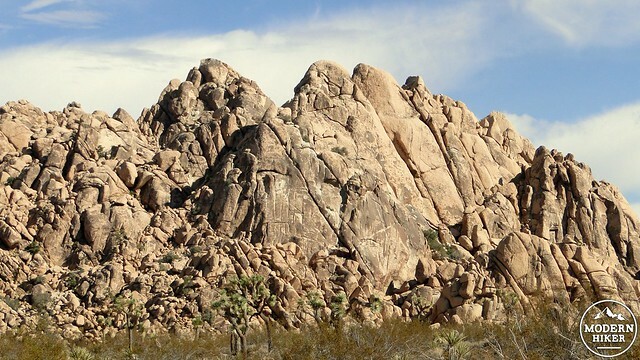 Such blocks of igneous rocks – in this case, monzogranite – are referred to as plutons, and the rocks that comprise plutons are often referred to as plutonic rocks. This particular plutonic mass featured a large number of vertical faults within its structure, which provided an opening for various weathering agents, including water, wind, and ice. Since that time, movement from the San Andreas fault has caused this block to tilt and rise. Erosional forces stripped away the surface rock above the block, which then became exposed at the surface. As the various faulted blocks became exposed, they were also subjected to erosion processes that slowly wore the sharp edges from the rock. This process is similar to what happens to an ice cube when held under running water. The water will wear away the hard edges leaving a rounded hunk that will continue to wear away the longer it is exposed to water before it melts away completely. 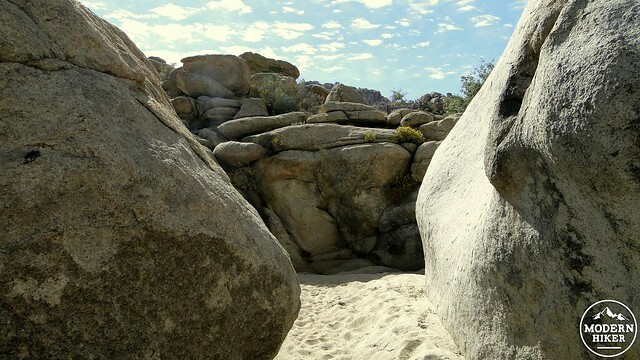 The monzogranite rock piles at Joshua Tree have undergone a similar process, albeit one that has moved millions of times more slowly. Meanwhile, periodic flooding wore deeper grooves through the larger faults in the pluton creating an labyrinthine complex of towering granitic structures that we now call the Wonderland of Rocks. 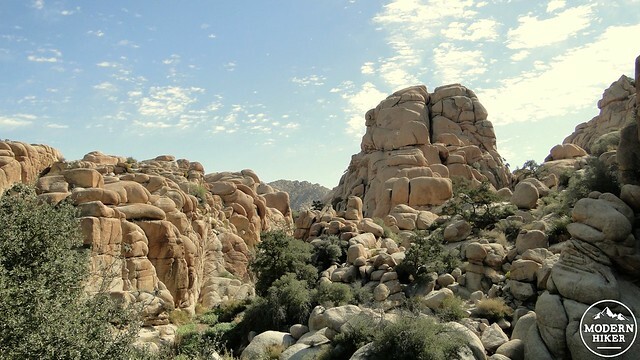 Today, the Wonderland of Rocks is one of the principal attractions of Joshua Tree National Park. 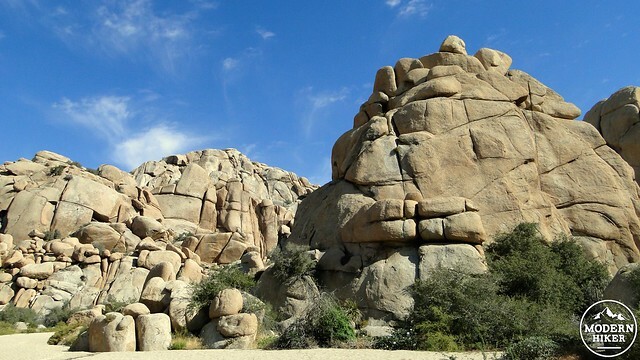 Rock climbers, hikers, campers, and looky loos come from near and far to walk through, climb upon, and snap selfies before the magnificent and often bizarre formations surrounding the Hidden Valley, Keys Ranch, and Queen Valley regions of the park. 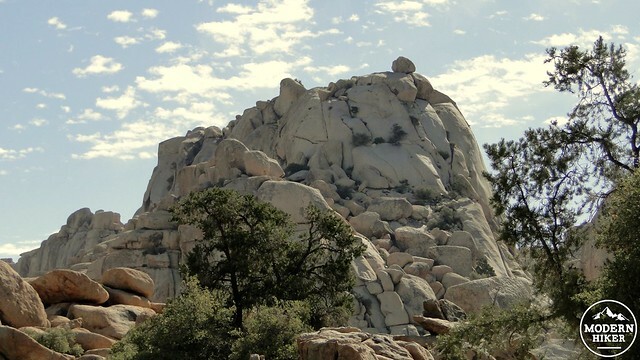 Many of the park’s most popular destinations, including Keys Ranch, Barker Dam and its attendant petroglyphs, Jumbo Rock, and the Maze allow hikers to explore these famous rock piles up close and personal. The hike to Willow Hole allows one of the finest up-close looks at the Wonderland of Rock. 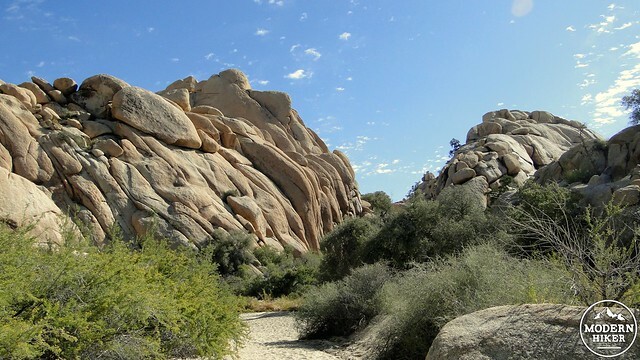 The Boy Scout Trail travels through open Joshua Tree woodland, gradually approaching the western edge of the Wonderland before leaving the trail to follow a meandering wash to a subsurface oases that supports a dense grove of desert willows. Given that this is a high desert environment above 4,000’, you will also remain within the pinyon-juniper belt once you enter the Wonderland, and you may find yourself surprised at how much vegetation you will encounter. 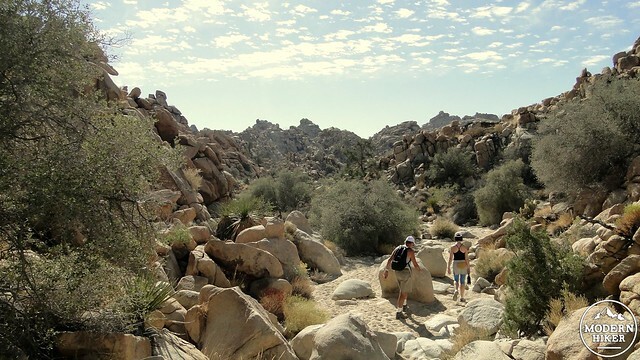 Starting from the Boy Scout Trail, head north over the compacted sand trail through a vast woodland of Joshua Trees. 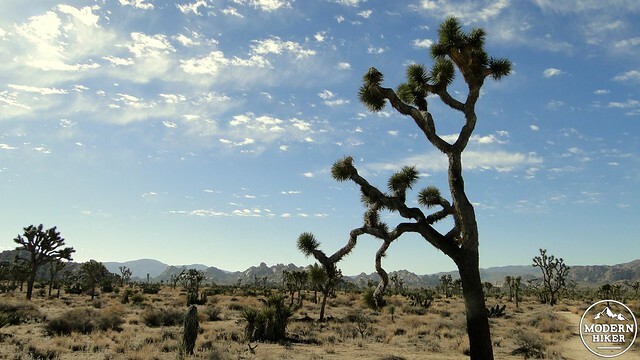 The Joshua Trees are the signature plant of the park, but they are not true trees. Part of the yucca family, the Joshua is only tree-like in its appearance while it maintains the characteristics of other plants in the yucca family. The trunks are composed of many small fibers instead of wood, and there are no tree rings to measure age. Joshua Trees have extensive root systems that can reach up to 35 feet out to take advantage of as much moisture as possible. The tallest Joshuas grow as tall as 50’, and some of them may live as long as a 1,000 years. The straight, smooth, and flat Boy Scout Trail provides easy hiking as you approach and eventually pass a large rock formation on your right that signifies a boundary for the Wonderland of Rock. At 1.2 miles, a side trail on the right will depart the Boy Scout Trail heading northeast in the direction of the Wonderland. At 2.5 miles, the trail disintegrates into a wash, which you will follow for the duration of the hike. A word of caution on hiking in the washes: Many of the washes in the Wonderland of Rocks tend to criss-cross in a grid-like pattern. There are numerous side washes that can lead to dead-ends or into confusing labyrinths. As you progress, the rock piles become larger, taller, and more daunting to non-skilled climbers, making it hard to survey your location from above. This creates the potential for confusion and even getting lost. If you wish to hike to Willow Hole, but you do not have a great deal of confidence in your navigational skills, consider the GPS track attached to this write-up to be your Ariadne Thread. Continue to follow the wash as it narrows while the rock piles surrounding you grow taller and more fantastic in shape. 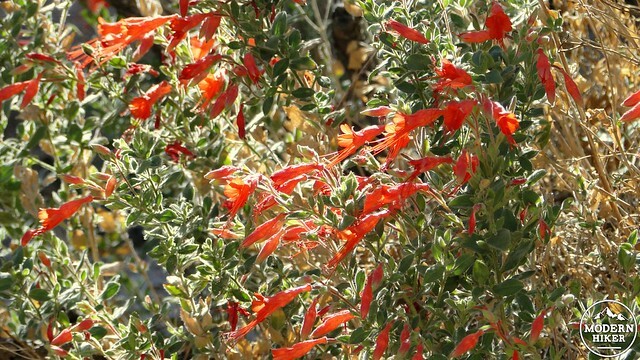 By now, you will have encountered numerous examples of single-leaf pinyon pines, California juniper, and Muellers oak. These species provided principal food supplies for the Native Americans who populated this area before the arrival of European settlers. Many of these trees seem to rise directly out of the rocks. Their root systems are able to find places in the cracks where water accumulates above and below the surface. All around you now are massive rock piles forming fantastic shapes. Boulders perch precariously high up on rounded granite domes, while myriad side canyons and crevasses invite exploration. At 3.3 miles, the wash widens substantially and begins to bend to the right. After you come around this bend, you will encounter a thicket of willow trees, through which you can hike before the wash closes up in a broad amphitheatre. This is Willow Hole, the destination for this hike. 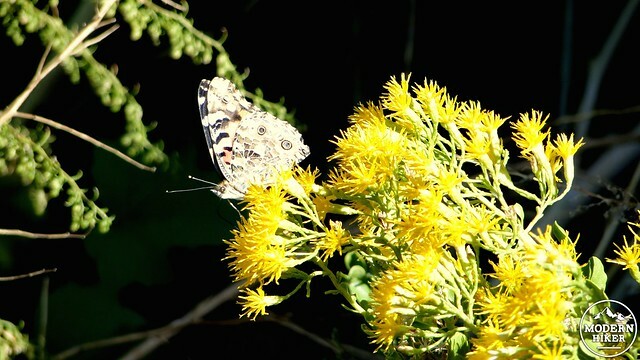 At Willow Hole, you will find numerous places to rest and enjoy the scenery around you. With the abundance of trees and somewhat regular supplies of water, you will encounter a lot of birds in the area, in addition to possible sightings of larger animals such as bighorn sheep. For those tempted to backpack in this area, be aware that park regulations cite that while you may camp one mile away from a road and at least 500 feet away from any water source, nearly all of the Wonderland of Rocks is designated for day-use (generally, the area west of the Boy Scout Trail is ok for backcountry camping). 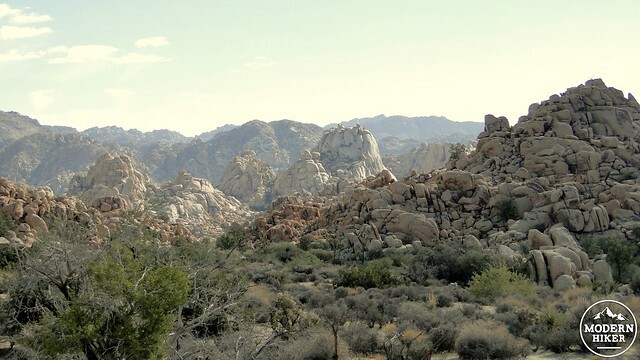 Additionally, for remote camping in Joshua Tree, you will need to park and register at one of the park’s backcountry boards. As tempting as Willow Hole may seem as a camping site, it is off-limits to all but day hikers. Once you’ve completed your reconnaissance of the area and feel ready to return, carefully retrace your way along the main wash before emerging at the trail that will eventually connect with the Boy Scout Trail for an easy walk back to the car. 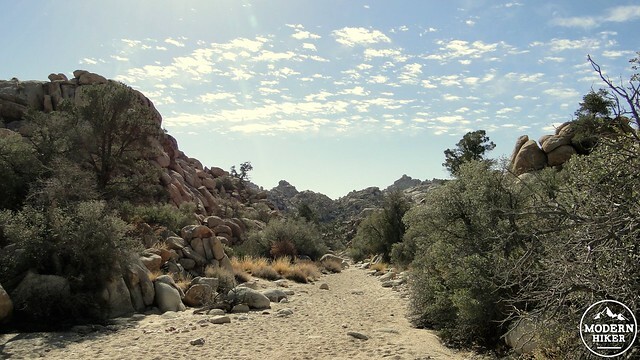 The Boyscout Trail and the connecting trail to the wash are well-maintained and smooth, although the connecting trail features some soft sand sections that make for tedious walking. The heart of this hike occurs along a wash that connects with numerous side washes, which may create some confusion. If you attempt this hike, be sure that you have at least moderately well-developed navigational skills or that you are utilizing the attached GPS track to avoid the potential of taking a wrong turn and getting lost in the Wonderland of Rocks. 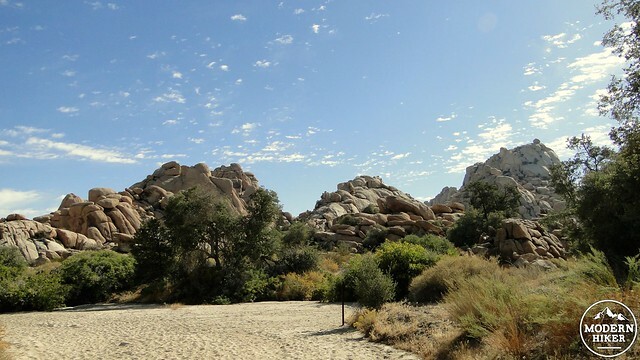 There are numerous campsites nearby, including Hidden Valley, Jumbo Rocks, and Ryan Campground. All three of these campgrounds are first-come, first-serve. Hidden Valley is especially popular due to being a hot spot for climbers. 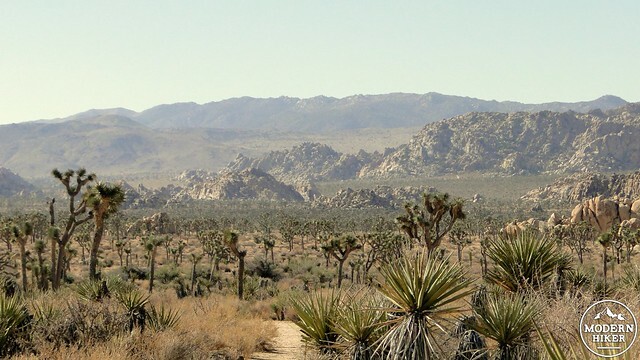 Joshua Tree National Park's camping policy does allow camping within 1 mile of a road, so long as you are at least 500 feet away from a water source. 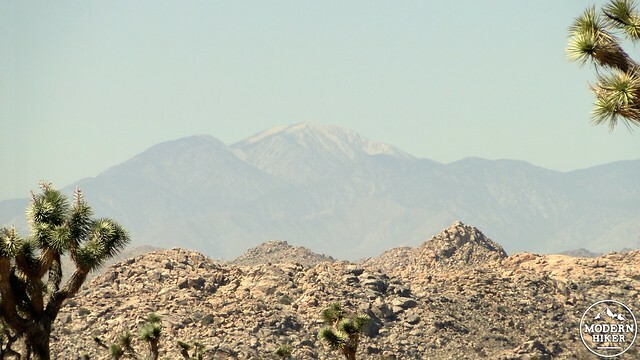 From Joshua Tree, head east on Highway 62 and take a right on Park Blvd. Enter the park and pay the entrance fee. From the entrance, drive 6.5 miles until you reach the signed trailhead for the Boyscout Trail on the left. I’m sorry. My phone autocorrected your name, Mardee. My apologies. Hi Marie. I did double check my sources - now, and when I wrote this. I took that information from a USFS database page that described a number of aspects of Joshua Trees. Now, it’s totally possible that this information is either out of date or incorrect, so if you’d like to provide what you feel is a more authoritative resource, I’ll gladly revise the text. Their average higher-end of their lifespan is about 150 years, but 500 year-old examples have been found and the oldest on record is believed to be about 1000 years old. 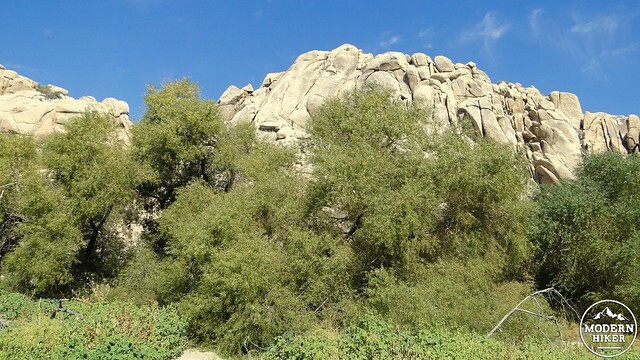 Double check your sources about Joshua Tree root systems and how old they can live. All the Joshua Trees I have seen have extremely shallow root systems, they a very fragile. They do not live until 1,000 years old. I have read more towards 100 years old. I highly recommend this hike! It’s so beautiful and remarkably varied as you hike thru a transitional landscape. Easy and flat too! Enjoy! Hi Angee. The trail doesn't run racha the rocks until you're quite a ways in. The approach is relatively uninteresting, so this may not be the best hike for your kids. We are headed to Joshua Tree the first of April. I know my kids would love the rocks described in this post but am not sure they'll be up for 7 miles. Would it be worth it to only hike this part way or should we stick to other shorter hikes? I looked at the topo maps for the area, and it does appear that there is a clear way to hike through. However, given that I cannot recommend trying it without knowing your level of backcountry nav skill, I won't describe it. However, if you're curious about a route, and you have good nav skills, send me a message. I am sure there is, but I would not recommend you attempt it unless you are quite accomplished with map and compass navigation. You'd have to cut through the Wonderland of Rock to do it, and that place is essentially a gigantic maze. I know people have gotten pretty lost there, so you'd have to be sure that you are well-prepared. I did this hike yesterday with my 2 boys and it was phenomenal. I was wondering if there is a way to cut across from Willow Hole to Barker dam?? I just love the Wonderland area and want to explore it some more.